When you are paying for carpet cleaning you expect to see the difference especially if you had spots or stains. Results matter not just for carpet cleaning but for tile and grout cleaning and upholstery cleaning as well. If you don’t see a difference you’ll be left wondering what exactly it was you paid for. Beyer Carpet Cleaning San Antonio knows that results matter and they want you to see the difference each and every time. They guarantee to remove 95% of spots or stains in your carpet with their best service carpet cleaning. The stains they can remove include but are not limited to drink and food stains and grey or black traffic spots. They guarantee 95% because there is no way to know which stains have gone beneath your carpet and onto your padding. Sometimes when something has gotten into the padding it can make a stain look like it’s gone on the surface for a little while but it will then slowly reappear. Other things they don’t guarantee are stains that change the property of your carpets such as red stains which tend to dye the carpet, ink, wax, gum, nail polish, paint, etc. However, just because you may have these stains in your carpet doesn’t mean that all hope is lost. There is a great chance that Beyer Carpet Cleaning may be able to remove these stains with an additional service. They have a very high success rate of removing red stains and ink. 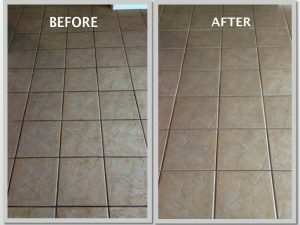 When it comes to tile and grout cleaning or upholstery cleaning you also expect to see results. Beyer Carpet Cleaning offers a full tile and grout cleaning restoration. By putting down an alkaline cleaner and steam cleaning they are able to turn grout that was once white but over time turned black back to white. Their extensive upholstery cleaning includes a fabric cleaner that removes most spots and stains. 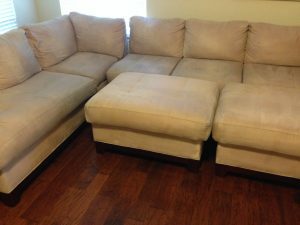 They can make a sofa that has been sitting in a garage for years and has slowly started to discolor look almost like new. Whatever it is they are cleaning Beyer Carpet Cleaning performs to the highest degree of perfection so that each of their customers are satisfied with their cleaning. 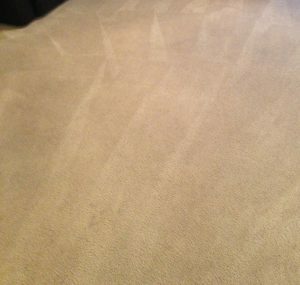 To prove just how effective their cleanings are Beyer Carpet Cleaning has a gallery of photos from actual jobs showing how the carpet looked before and after they were done cleaning. They also have tile and grout cleaning photos and upholstery cleaning photos. They are proud of their work and can’t wait to show you what they can do for you!